We were looking to get away from the city again and see a little bit of fall color so we went to the town of San Lorenzo which is about 45 minutes away from Madrid. We arrived around 10:00 am and made a quick stop for some delicious pastries and coffee before heading out to see the sights. It was a beautiful cool Sunday morning as we walked through the very quiet streets of this picturesque town. I use to think the Japanese were late risers, but the Spanish have them beat. They don’t wake up until about noon! The main attraction here is the Monastery, El Escorial, a UNESCO World Heritage Site. It was built during the reign of King Philip II in the mid 1500’s. When it was built, it was the largest building in the world for quite a long time. The outside is very stark and boring looking – reminds me more of a prison. It’s in an extremely pretty area though and it really stands out. They don’t let you take pictures inside the complex, so in order to see what it looks like on the inside, you will have to click the link above or, better yet, go see it for yourself. Overall, it’s really impressive. To adequately see the whole place, it takes 3-4 hours and you have to follow the arrows or you will get lost. It’s so large, it actually houses several museums, a palace, a mausoleum, a church, a library and a school all in one. They should sell multi-day tickets. You have to be FAR away if you want to get a picture of the whole place. If you pay the fee to go inside you get to see a collection of tapestries and a huge painting by El Greco, followed by the Museum of Architecture which includes drawings that were used to design the building as well as the materials they used to build it…it’s pretty amazing. Then there is the never-ending art gallery. While Philip II was known to be a fairly modest and simple king, he loved art and collected over 1,500 paintings and commissioned some 500 frescos (the frescos are fantastic). I’m not sure we saw that many but it sure felt like it. Next we saw the palace and royal living quarters. That wasn’t very exciting. It was mostly just rooms with furniture and a few decorations. There was one wooden door however that had exquisite detail all over it which looked like something probably done in Japan or China. We also got to see King Phillip’s room – preserved exactly the way it was the day he died – kinda creepy. The views out the palace windows of the gardens and surrounding countryside were beautiful though. I did manage to sneak in a couple pictures of that! The coolest thing in the whole place was by far the solid pink & black marble hallway and staircase which descended deep into the Pantheon. This solid marble circular room contains nearly all the Spanish Kings from the last 400 years! Standing in the center of all those black marble & gold caskets was a bit intimidating. There are only two spots left – and they are for the current king’s parents. 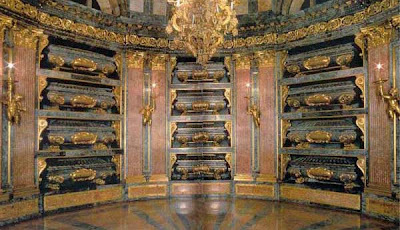 The current and future kings of Spain will have to be buried somewhere else. We passed thru at least a dozen other tomb “rooms”. They housed all the other royal family members including princes, princesses, husbands, wives, infants and children. It gets pretty depressing after a while. The most bizarre tomb we saw was for the infants which is oddly shaped like a wedding cake. We proceeded onward to the grand hallway and staircase, the old chapel, the huge basilica (in which Mass was being held), and finally the library. The library is considered to be one of the most important historic libraries in the world. It supposedly contains about 45,000 works from the 15th and 16th centuries, and thousands of manuscripts in Arabic, Latin, and Spanish. It is a beautiful library, but it didn’t feel that big or that old. It didn’t even smell old (like the Trinity Library in Dublin did). It’s nearly in mint condition. The bookcases are beautiful and the ceiling is strikingly bright and colorful – decorated with frescoes related to the the seven liberal arts. It was fun to try and find them! To see some more pictures click on the picture. This entry was posted in Parks & Gardens, San Lorenzo, Travel within Spain and tagged history, monasteries, museums, Travel within Spain, UNESCO by Rose Northcutt. Bookmark the permalink.